A quarter of century after the fall of the Berlin Wall, a number of post-communist countries have made impressive progress towards media freedom. From doctored weather reports (in the USSR and Romania, according to Herman Ermolaev, an expert on Soviet censorship), party propaganda, strict censorship and jamming of Western broadcasts, they have moved to the top of press freedom indexes. Some of the countries that joined the EU in 2004 have trumped long-established Western democracies such as Britain and France in the index launched in 2002 by the Paris-based media watchdog Reporters Without Borders (RSF). 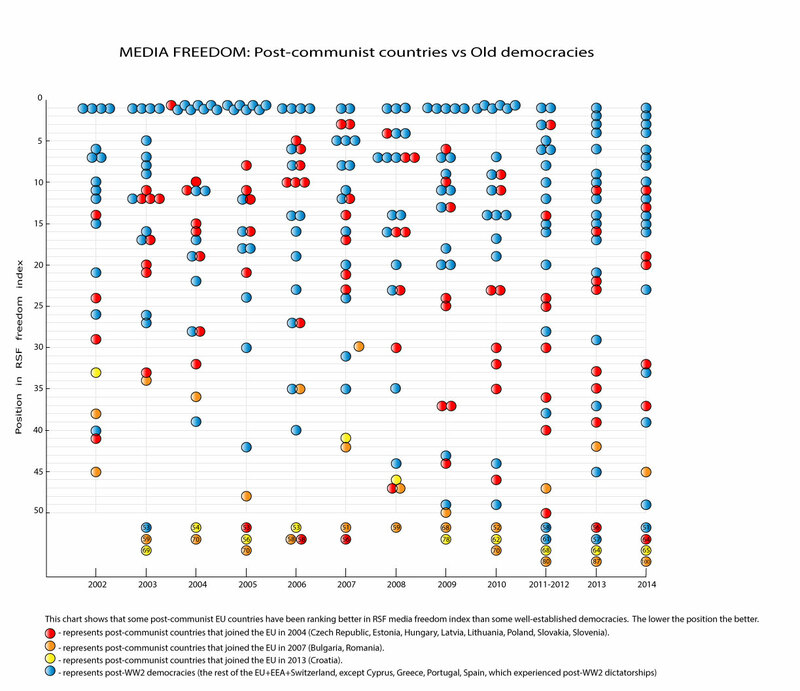 Slovakia was joint first in 2004 and third in 2007 in the RSF index, in the same league as northern European paragons of media freedom such as Finland and Norway. In 2006, six post-communist countries came in the top ten and RSF praised the Czech Republic, Estonia, Hungary, Latvia, Lithuania, Slovakia, and Slovenia as havens of freedom of expression. Many of these countries have since hit a few snags, which led to their fall in media freedom ratings. However, some seem to be on their way back. Four post-communist countries came in top twenty in the latest RSF index, ahead of the UK, France and Italy. But the picture is uneven: Hungary made impressive progress only to fall back dramatically in recent years. A law passed in 2010 established a new regulatory body with sweeping authority over all media and drastically curtailed the independence of public-service broadcasters. The only EU members to fare worse than Hungary in RSF’s 2014 index are post-communist Croatia (65) and Bulgaria (100) as well as Greece (99).